We are blown away by the AMAZING support we have received for our 2018 The Big Give Christmas campaign. 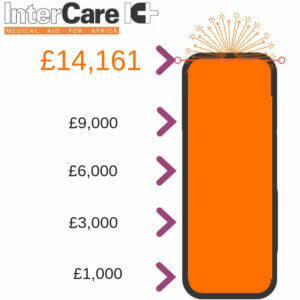 This has been our most successful Christmas campaign to date, raising … *Drumroll*… £14,161 (Online total)! Your donations will send our remaining 300-outreach rucksacks, along with 37 top-up packs! Ensuring the outreach rucksacks will continue to be beneficial for our partner health units in Africa. “Send our regards and thank you to Arthur for donating the attached backpackers for palliative care project. This is a very good gesture and greatly appreciated. May the good Lord bless him and all of you for caring and being there for us always. “Thank you very much for each and everything which you are doing to help our facility, may the good lord bless you abundantly. We are highly appreciate your kindness and generosity, which you have been showing us several times, each year. Your donation is helping our facility and patients who are not manage to buy drugs. We are happy to hear that you are still ready to support our health unity, stay blessed and God take care of you. Send many greetings and thanks to who provided red outreach rocksacks. Yours sincerely in Christ, Sr C Manara” – Baraki Sisters Health Centre, Musoma, Tanzania.